► Jill Abramson (left) will become the Executive Editor of The New York Times, the 1st woman to hold that top journalistic job since the paper was founded 160 years ago. (photo credit) Formerly and investigative reports and chief of the Washington bureau, she's been The Times' managing editor since 2003. ► Kathryn Ruemmler (below right) will serve as White House Counsel. 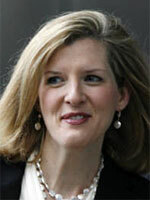 She's been Principal Deputy Counsel to President Barack Obama since January 2010. Before that she was a federal prosecutor, a Deputy Attorney General at the U.S. Department of Justice, and a private practitioner. (photo credit) Ruemmler's the 3d woman to become White House Counsel. The 1st was Beth Nolan, appointed by President Bill Clinton in 1999; the 2d was, of course, Harriet Miers (prior post), whom President George W. Bush subsequently tried, in vain, to put on the U.S. Supreme Court.